Lil' Wayne was supposed to perform at Fashion Rocks in NYC on Friday night, but his performance was axed because he refused to go through security. Page Six reports that he showed up on time and refused to have his bag searched or have a security wand passed over him. 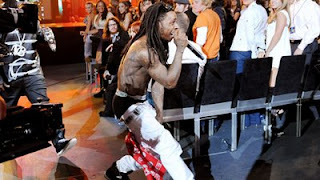 Wayne said, "I don't need your [bleeping] show - I'm leaving if you make me do this." Wayne got in his car and left then a few minutes later, his management called the Fashion Rocks people and begged them to let him perform- It was too little too late. Meanwhile, Weezy F. Baby was in court yesterday answering to charges that cops found a 9 milli on his tour bus earlier this year. If convicted, Wayne faces four years in the pokey.